CB141. Torre Annunziata, Wall and double column, 100m west of Villa di C. Siculus. Wall of opus incertum and colonna gemina (double column) found in February 1940 in Torre Annunziata, just 100 metres west from the site of the Villa of C. Siculi. Discovered during execution of extension work to the building owned by Valentini Vecchi. Immediately reburied. Archivio SAP, Relazione Ispettore Onorario Luigi Jacono, Torre Annunziata, 27 May 1940. Casale A., Bianco A., Primo contributo alla topografia del suburbio pompeiano: Supplemento al n. 15 di ANTIQUA ottobre-dicembre 1979, 141, p. 49. Clarke, John R. 2014. Oplontis: Villa A ("of Poppaea") at Torre Annunziata, Italy. New York: American Council of Learned Societies. Oplontis project eBook. Malandrino, C., 1977. Oplontis, Napoli, pp. 53-54 and fig. 9 n. 4. Villa CB141. Torre Annunziata, Location plan. 4: Villa CB141 Remains uncovered in 1940 and reburied without further investigation (Casale Bianco 141). According to Malandrino [writing in 1977], in February 1940 emerged other important archaeological evidence derived from a report by the Eng. Jacono now in the Archivio della Soprintendenza. At a depth of 7m below the ground level, on the continuation of the south-west corner, to 32.50m from the road front of the “villino”, were discovered some walls of opus incertum, of which a stretch to a lower level, at an obtuse angle, had the function of a stylobate (top step of a platform), on which there was a colonna gemina, [a double column] in two different diameters, one of 0.60m and the other of 0.45m. These structures, which extended into the neighbouring property to the west, were, however, according to the report, reburied without further investigation. See Malandrino, C., 1977. Oplontis, Napoli, pp. 53-54 and fig. 9 n. 4. See Notizia tratta dall'Archivio della Soprintendenza Archeologica di Napoli, relazione dell'ing. Jacono. According to Marasco, on 12 February 1940 the remains of a wall and a double column from the Roman period were found in a building on the property of Valentini Vecchi that was located on the western side of the road that leads from Naples to Salerno (present-day Corso Umberto I), about 100 m from the Piazza Ernesto Cesaro. The discovery occurred during excavations undertaken to expand the building into the area of the garden where it comes close to the coast and was made at a depth of 7 m below street level and about 32.5 m from the present-day Corso Umberto. Employees of the Superintendency with the engineer, Inspector Luigi Jacono, made drawings of the find (3.15). 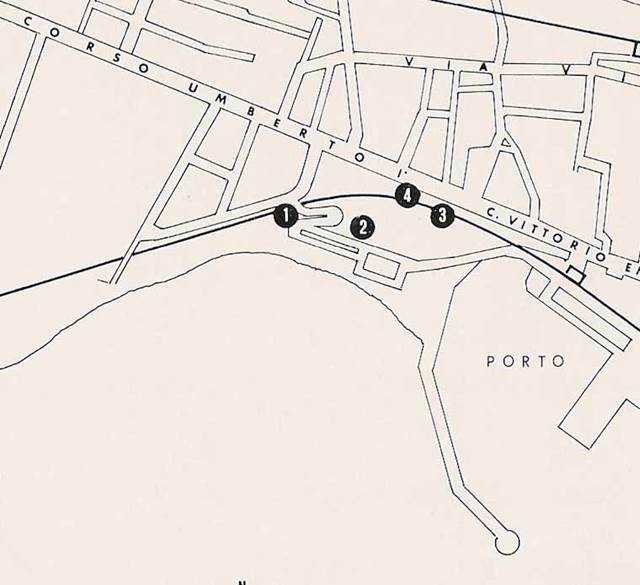 Jacono made very detailed notes about the particulars of the find, which he described in a report (44) to the Superintendency in Naples on 27 March 1940. Jacono report on excavations at the Vecchi property. b) on this wall, right at this angle was placed a double column made up of two drums of identical material but differing diameters with the larger having a diameter of 0.6 metres and the smaller having a diameter of 0.49 metres. The two pieces we received were: one, still in situ, of 0.75 metres and another fallen to the south of it of 1.2 metres. The column was plastered with a good quality plaster, smooth and painted a dark red to a height of about 1.35 metres while the rest was left white to a height of about 2.5 metres. Such was the state of the larger column, which also had a small loss at the base. There where the smaller column was visible on its lower part we could see remains of vertical fluting. On the northern arm of the stylobate was found a small pool, 0.6 metres long, 0.4 metres wide, and 0.5 metres deep with its northern wall leaning in slightly, making a hopper shape. In the vicinity of these remains, as the excavation was extended a little in all directions, several terracotta amphora fragments were retrieved as well as a little terracotta column meant to support the suspensurae (suspended floors) of a tepidarium or a caldarium. It could be that a Roman villa existed here and that the columns were elements of a double peristyle; but if this villa is still there, if it extends westwards, it would be under the adjacent building beyond the Vecchi garden. Vecchi at one time thought of raising the column onto the garden level to place it over the spot where it was found, but when he tried, it fell apart and the undertaking was given up and the ditch that had been dug was filled. The column lay encapsulated in a bank of alluvial soils almost as compact as those that cover Herculaneum; and in it the ancient Romans, in looking for objects, had dug various converging tunnels from all directions of the supposed peristyle. See items referred to above, on Clarke and Muntasser Oplontis eBook 2014, using links below. According to Marasco, the finds may be part of the building attributed to Gaius Siculius C. F. discovered during the Bourbon-period excavations for the railway trench. This theory is made plausible by the proximity of the site in question to the present-day railway embankments. It is however worth noting that Jacono attributed to scavengers from the Roman period the tunnels found in the layers of volcanic ash. The tunnels could have been made at any time between the beginnings of this type of exploration in the eighteenth century and the twentieth century by people taking who knows what precious finds. If this is the case, we shall never know the truth about what was buried here.